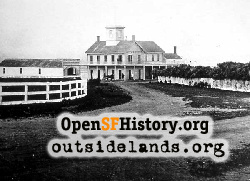 Built 14 years after the city's first race courses opened in the Mission District, the Ocean Course---sometimes called the Ocean View Course---occupied 100 acres of land leased from the Greene Family, and was the first of four (or possibly six) west side horse racing venues. It stood across the Ocean House Road (today's Eucalyptus Drive) from the popular Ocean House, a recreational destination since the early 1850s for overwhelmed city dwellers seeking the relaxation and enjoyment of the country and sea. 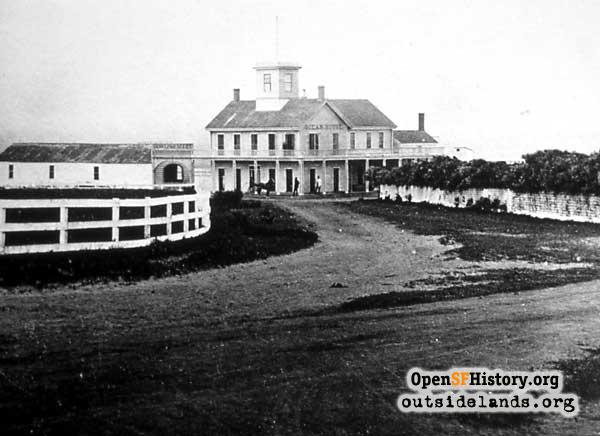 Bounded approximately between today's Eucalyptus, Sloat, Everglade and 24th Avenue, the Ocean Course operated from May 23, 1865 to November 15, 1873. Its opening and closing races were two of the most exciting and best attended sporting events in California at the time. What we visualize when we think of horse racing---galloping steeds with lightweight jockeys barely in contact with their stirrups---was the exception in the 19th century. Until the turn of the 20th century organized horse racing was primarily harness racing. Jockeys were called "drivers," since that was what they did, sitting in high-wheeled sulkies, with trotting or pacing horses leading them. Also, races were conducted differently then. They were tests of endurance rather than speed. Both harness and thoroughbred races were run in multiple heats of one to four miles rather than single races. On May 23, 1865, 8,000 excited race fans, an unprecedented number to witness a sporting event in California, converged on the Lake Merced site for the inaugural race between two great Kentucky-raised thoroughbreds: Lodi and Norfolk. Norfolk was clearly the sentimental favorite. The horses were to run three two-mile heats. The first heat was a tie. A half hour intermission allowed the horses to recover before Norfolk won the second heat by four lengths. Following the recovery period, the third heat began with a false start, but it ended with Norfolk winning by more than five lengths. The last race at the Ocean Course was the much heralded "Great Race," featuring Thaddeus Stevens, a California-born thoroughbred, against a field of "Eastern" horses. Throughout the late 1860s and into the 1870s, California tried to establish itself as a credible horse-raising state, equal to Kentucky, New York and other Eastern states. Sadly, California's best were not good enough. Year after year, California's horses (in this case, trotters) and hopes were humiliated and dashed. Not even Governor Leland Stanford, one of the wealthiest men in the state, who raised the best horses in the state, was immune to this disgrace meted out by Eastern horses. In 1872, while California trotters were continuing to endure their years of futility, "Old Thad" was, at first, quietly winning thoroughbred races. Then he was noticeably winning more races. Finally he was winning in spectacular fashion. His achievements were noted; challenges were made and accepted; victories continued and Californian horse lovers began to believe that Old Thad would be their deliverance. A date: November 13, 1873. A place: Ocean View Course. A field of horses and a $20,000 purse were announced for what was immediately termed "The Great Race." Thaddeus Stevens was to run against two of the best Eastern horses. The San Francisco Chronicle predicted that the race "will be the greatest ever run on the Pacific Coast and it bids fair to prove the greatest ever run in this country." For one dollar, an estimated 10,000 people found accommodations inside the track. For two dollars, 10,000 more were admitted to the grandstand. An equal number were settling down outside the track at no charge. Estimates of as many as 40,000 people in and around the track were reported. This was an unprecedented, historic number of people to witness a single event of any sort in California. They were all there to watch Thaddeus Stevens prove that California's horses were the best. At three o'clock, an hour late because of a small fire, four horses approached the starting line: Thad, Joe Daniels from Michigan, True Blue from Kentucky, and Mamie Hall, another California horse, though not a contender. Joe Daniels won the first heat in 7:45, three lengths ahead of True Blue, who was the same distance in front of Old Thad. Mamie Hall had thrown her rider and was disqualified. The second heat began after a 45-minute rest period and was won by True Blue in 8:08, five lengths ahead of Joe Daniels. Old Thad was again third. Because of the delay, daylight was running out, and the horses were given just a 15-minute rest before the third heat. Joe and True Blue had each won a heat. If either were to win the third heat, the race would be over. For more than three grueling miles, oblivious that they had already run eight miles, Old Thad battled neck and neck with True Blue. In the final mile True Blue had sprung a tendon and was out of the race. Joe Daniels shot into second, but Thaddeus won by ten lengths in 7:57. During the 30-minute recovery period, darkness began to settle. Lamps were lit along the homestretch and on the carriages in the infield. A fog was pushing in from the ocean when the two remaining horses, Joe and Thad, were brought out for the final heat. At 5:20PM the starting bell was struck and they were off. Turning onto the backstretch, Thad was ahead by two lengths as the horses disappeared into the shadows and fog. When they rematerialized on the home stretch, Thad was ten lengths ahead. The California horse led his Michigan rival the entire race, sometimes by as much as thirty lengths, crossing the finish line in 8:20, ten lengths in front. After sixteen miles of racing, California's favorite son proved that California horses were indeed among the nation's best. The New York Times, in an unabashed understatement, wrote "the enthusiasm of the crowd was overwhelming." The hometown papers wrote: "It was undoubtedly the most extravagantly joyous crowd that ever thronged a race track on the Pacific coast." When Thad passed under the wire and the race had been won "men threw up their hats, stamped upon the ground, shook hands, slapped one another upon the back and rushed wildly hither and thither while ladies waved their handkerchiefs and smiled happily." THAD VICTORIOUS headlined the Chronicle. THAD THE VICTOR seconded the Alta. The New York Times made it unanimous with THAD STEVENS THE WINNER. Despite these well-attended races, Fortune had not been kind to the Ocean Course. It suffered from three liabilities: location, location, and location. The truth was the track was in a remote and difficult to reach location from the city proper, and changes of ownership and management couldn't overcome that fatal handicap. Over its eight-year life, the Ocean Course hosted less than 100 racing days. No races were held between November 1868 and March 1871. Read another retelling of the Great Race in this article. Page launched 5 February 2008.